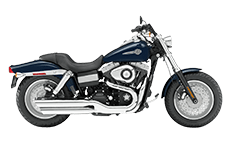 The Dyna Fat Bob motorcycle is one of Harley Davidson's finest machines to hit the road, so why would anyone waste their time or money on aftermarket luggage compartments that look boring and provide no support structure? Thankfully, Viking has a massive collection of saddlebags fit specifically for this bike, but even better, they're affordably priced and built to withstand the harshest punishments of the road. But don't just take our word for it; check out each saddlebag page for more information. .